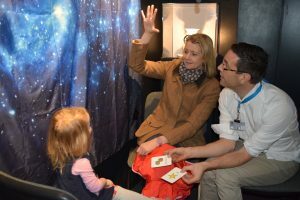 On the 9th and 10th of January 2019, the University of Edinburgh Move2Learn team held a dissemination activity at the 2019 Teeny Tiny Toddler Fest, at Camera Obscura & World of Illusions. This event is aimed at families with children aged 0-5 years to engage with science and become aware of current research happening in their local communities. Dr Zayba Ghazali-Mohammed, Move2Learn Research Associate, Dr Andrew Manches, Move2Learn PI (UK), and Alexia Revueltas Roux, Move2Learn doctoral student, re-designed the science charades game that was previously used in an adult dissemination activity at Glasgow Science Centre. At the Toddlerfest, adults were invited to take part in the game alongside their children and were presented with a card that depicted an everyday science word like “eruption” or “tree” for children to guess. Building on our Move2Learn research, adults had to communicate 30 words to their children in three different conditions: speech only (no action or gesture), gesture only (no verbal communication), or speech and gesture (our natural form of communication). Children in turn, had to guess as many words that their adult was trying to communicate to them.